DDuring the Kickstarter campaign for Archmage, Starling Games asked me to create a rules summary which they could include as a printed reward. Since then I’ve added a single page player reference sheet, so here’s that updated version. 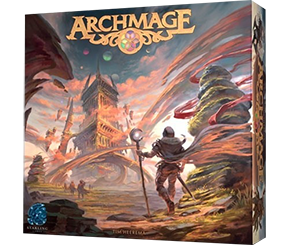 Archmage is an enjoyable and attractive game of worker placement, area control and a bit of deck building, with a bunch of powerful spells thrown in. There’s nothing like thwarting your enemy’s plans by throwing down a huge fiery chasm across the board just before their turn!